I’m going to discuss how I manage my near term tasks, essentially how I survive and get through the day. I will not be discussing project management, but instead how you effectively deal on a daily basis with the wide range of disparate tasks we all face in this multitasking modern world that we live in. 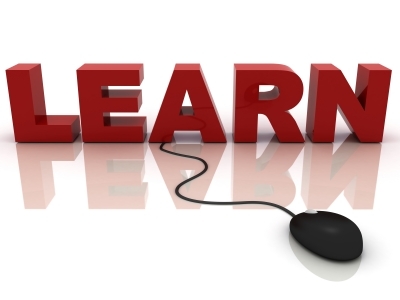 There are many methodologies promoted on the internet, such as Get Things Done and Time Management. The challenge is to find an approach that will work for you. Whatever the approach you adopt, I believe MindGenius will help you implement it more effectively as the application provides you with the essential building blocks for a task management system. I keep things simple. I don’t plan such tasks to the nth degree as the end deliverable is to complete the tasks not plan them. Also things have a habit of changing over the day so I have to remain flexible. If you are not careful you can spend more time planning than doing. It’s a matter of balance. The purpose is to manage your time and be more productive. Firstly I list down everything that needs my attention. I quickly decide, and record, what actions/activities I need to perform to complete these tasks. If appropriate I will delegate tasks, but there will still be an action for me to follow-up on these. Having got a list of tasks and actions, I collate these into groups, usually by the nature of the activity. I find this reduces the inefficiencies associated with chopping and changing when performing these tasks. Next I prioritise the tasks. What needs to be done first? What must be done today, or what could be deferred till tomorrow if I have too many tasks to perform today? I simply class them as High, Medium or Low priority. I use MindGenius categories to do this as they give a visual indicator as well as a means of filtering my task map so I only view the important tasks that I should be focussing on. 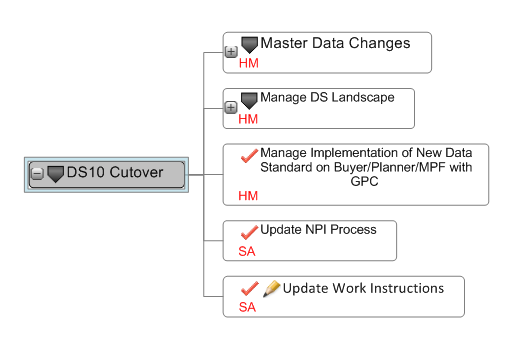 Having created my task map, it is important that I review it. Have I missed anything? Have duplicate tasks been included, or are there opportunities to combine tasks as they could more effectively be done together? Now I know what I have to do, the important thing is to go do it. You’d be surprised how often people create task plans, and then don’t look at them again once the day’s business begins. So it’s no surprise that they are shocked at the end of the day to discover they hadn’t achieved what they had set out to achieve in the day, in fact the task mountain has probably grown. 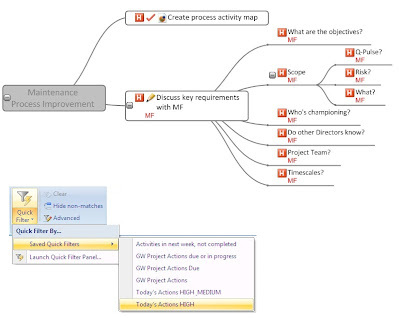 You need to work with your task map. As additional tasks and challenges appear during the day you need to add these to your map and rearrange your priorities to accommodate the change. You won’t always have electronic access to your map, nor is it always appropriate to be accessing it in certain conditions, e.g. during a discussion with your manager. I usually carry a printed copy of the task map with me when I am away from my desk. It’s simple to refer to and to jot down notes on it. 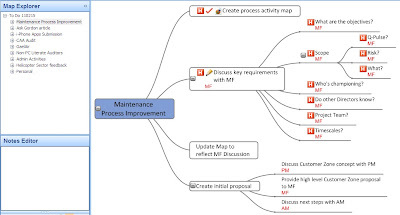 As you complete tasks, update your task map to reflect the progress made. It’s great to get a feeling of making progress and it also allows you to focus on the remaining tasks. 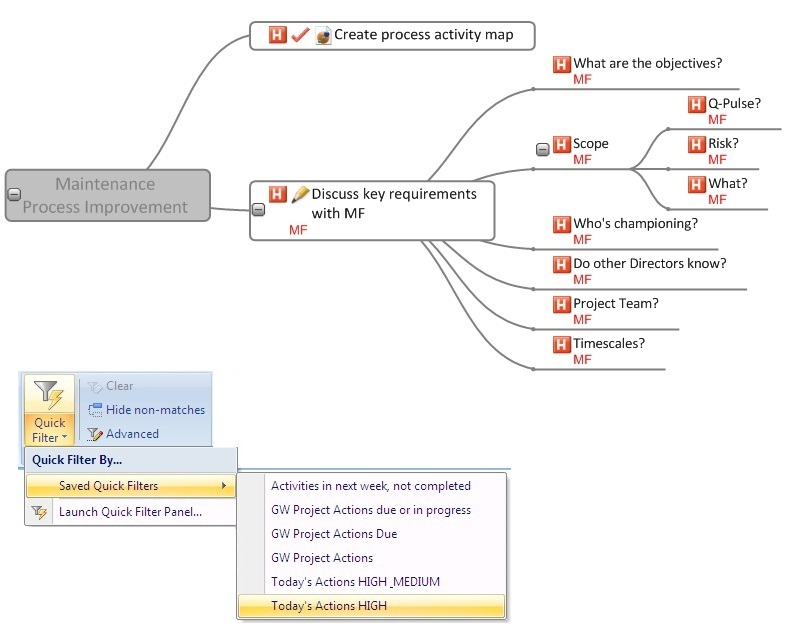 Here are some of the things that I do to make my task management activities that bit easier. 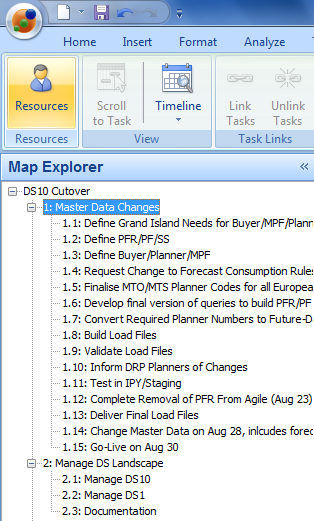 Save my task map to my PC Desktop so that it is always visible and accessible to me. I make the branch titles for the tasks self-explanatory. If you make them too cryptic, you won’t readily understand them when you filter the map. Mark the completed tasks as a completed action. This assigns a completion date to the task which you can refer to in the future if you hover over the action icon. If I am working on something electronic, I attach the file to the task branch. That way I can quickly get back to the file if I am jumping in and out of different tasks. I use the Timer in MindGenius when I am working on a task so that I avoid spending longer on the task than I should. It helps me avoids the temptation to go into too much detail and forces me to focus on content rather than format. If I have to see specific people, I assign them as a resource in my task map and use the Resource Map feature so that I can see who I have to talk to and what about. Other people’s time is just as precious to them as yours is to you. So if you get a chance to speak to someone, it is important that you discuss all of the areas you need to. You never know when you might get another chance to speak to them. I save my filter settings so that I can re-use them. This saves time and I know that they work the way they are meant to. When my task map is quite large, more often than not, I print it out on multiple pages – usually each separate grouping of tasks on an individual page. It lets you focus on a specific group whilst keeping your other tasks to hand but not in the way. Prior to the start of the next day I save the map under a new name (e.g. ToDoDDMMYY) and then remove the completed task from the original map and use what is left as the basis for the task map for the forthcoming day. The ‘history’ maps can be used when discussing progress with people. Alternatively, you may wish to do this weekly. These are just some of the ways that I use MindGenius to help me manage my near term tasks and get me through the day. Such approaches can be applied to personal tasks as well as business tasks. I hope this article will encourage you to use MindGenius to help you manage your tasks, and if you are already using it for this, I would be interested in hearing any tips you might have. Taking large documents and importing them into MindGenius can be a great way to dissect and understand the content. 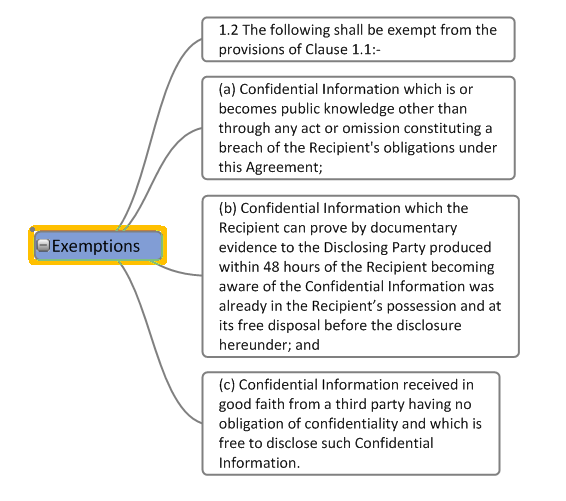 The complexity of Tender, Strategy or Legal documents can be more easily understood as the constituent parts become clearer when visually represented. The map can then be developed to formulate a reply, whether it’s a documented tender response or an actionable project plan. 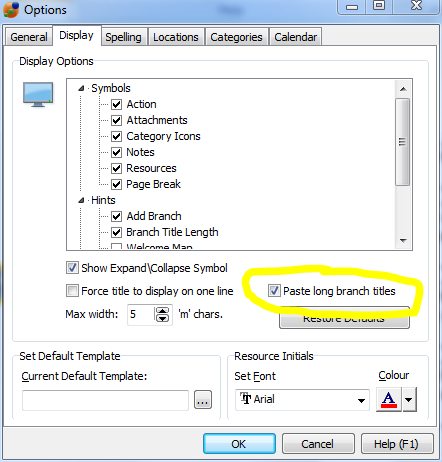 It’s crucial when trying to import an MS Word document that it is formatted using Word Heading Styles (Heading 1, Heading 2, etc.). It is these styles that will be used to create the hierarchy of the MindGenius map. 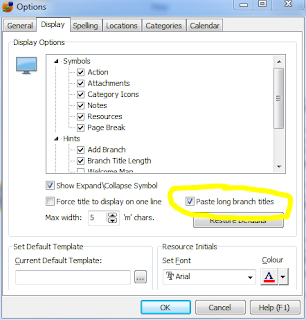 The first line of text in the document will become the core branch title and all normal text in the Word document will be treated as Branch notes. 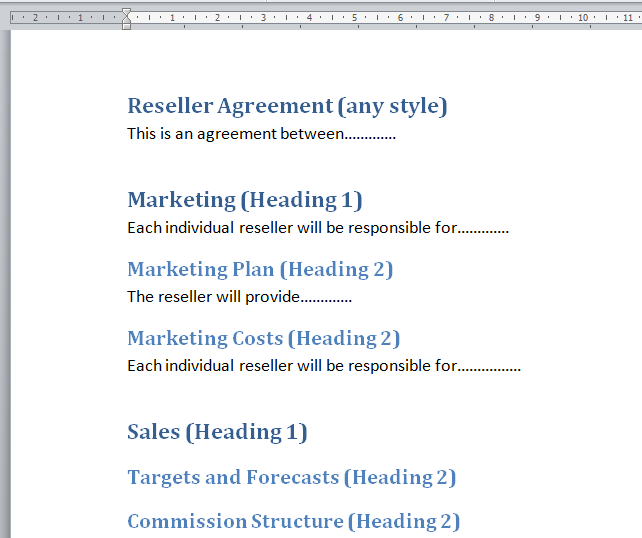 Only the Heading styles will become branches after the first line. 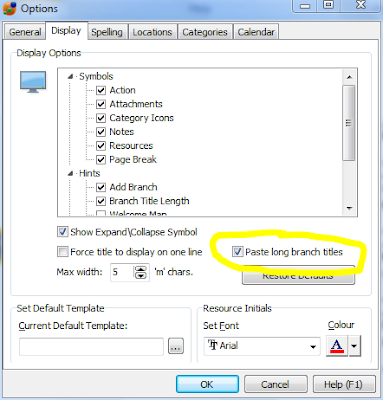 Therefore if you import a Word document that doesn't use the Heading style you will end up with a core branch and the entire document in the branch note! 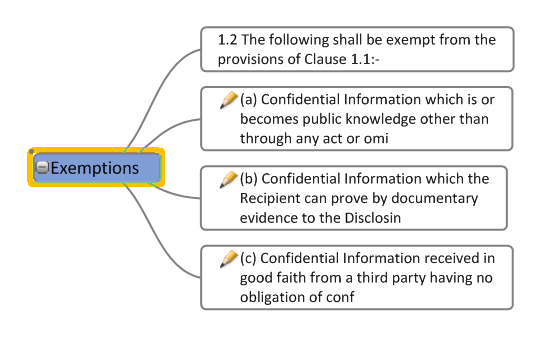 What if you're document isn't structured in this way? Quite often Word documents don’t come perfectly structured using the heading styles and therefore a perfectly structured map isn't created. 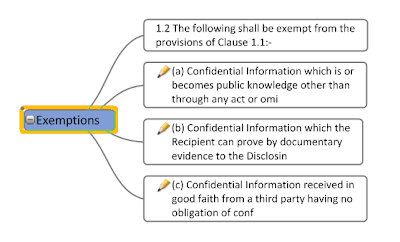 If the map cannot be easily tidied then sometimes with a little formatting of the original document you can prepare it such that it imports well. 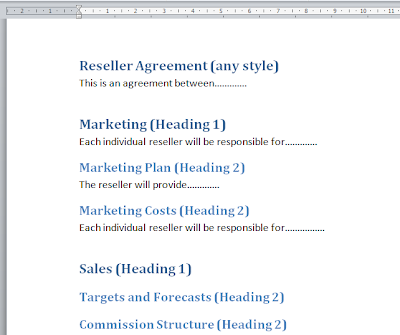 Going through the document selecting and formatting headings with the MS Word styles will help you prepare the document for import. 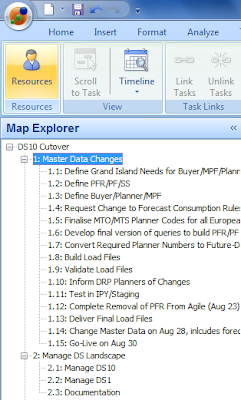 If all else fails, cutting and pasting from a word document into a map can still be a good way to dissect and understand documents before actioning. We hope this Hints & Tips article helps you to identify ways of extending your use of MindGenius. While many people may be able to operate across all 3 styles, some prefer just one but all 3 different learning styles can all gain benefits from using mind mapping software. Visual learners can quickly build up a bank of information independently and format mind maps appropriate to individual preferences. Auditory learners can use the software as a note-taking tool; convert mind maps into Word documents then use additional text to speech software to extend their understanding and learning. Kinaesthetic learners benefit as they are actively engaged in their learning either on an individual basis or as part of a group since the whole process of “doing” is paramount. 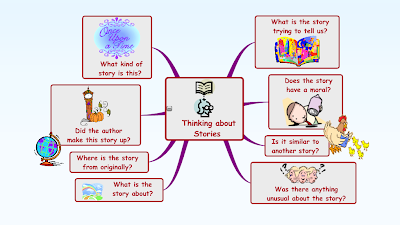 Visual learners can be particularly attracted to mind maps as it allows them to add graphics, colour and images to their notes. These help stimulate memory for this type of learner, improving memory recall. The benefits for other types of learner may not be immediately as obvious but Auditory learners can benefit from the note taking process or collaborative learning sessions using the map where discussion plays a part of the learning experience. It might also help this type of learner to talk through the explanation behind each branch as they are putting their map together. 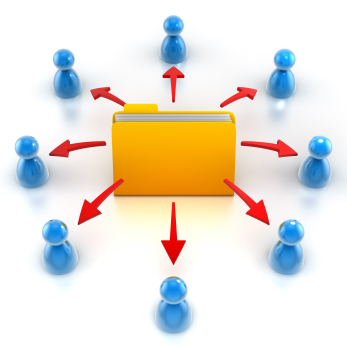 An added benefit is that text to speech software can be utilised to consolidate learning. Since Kinaesthetic learners enjoy activities where they “do” something, building a map can help them to be engaged. Focusing on how the branches look can also help with the “doing” process. Alternatively passing round a wireless keyboard in class, or having pupils move around to add ideas to a map at the front of class can help. And the sample map below could be used with a junior class to assist all learners – the pictures on the map are of benefit to Visual Learners, and Auditory and Kinaesthetic learners could benefit from undertaking the activity as a class discussion, or in small groups. 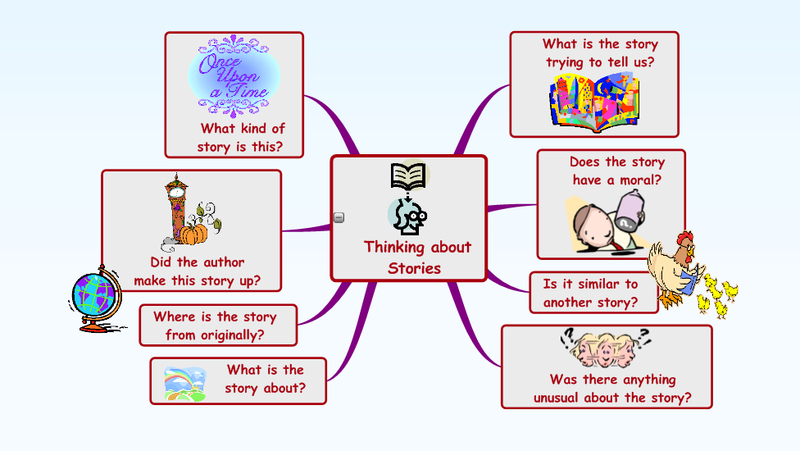 Download “Thinking about Stories” sample map. Do you have any tips for helping each type of learner to maximize their learning? 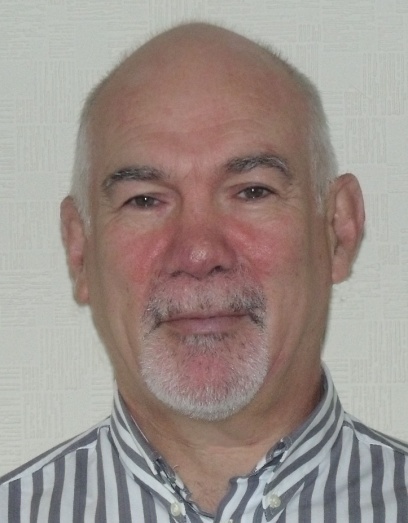 Henry Miller is ERP Project Manager at Life Technologies and has been using MindGenius for 9 months. He uses MindGenius for project planning and control on all shapes and sizes of projects. These can range from global supply chain change management projects to mini-projects such as working out the operational requirements for an office move to a new building. The objective of the project was to change the configuration of supply chain forecasts to a more aggregated model. The reason for this was to gain the benefits of more accurate forecasting based on highly aggregated demand. Henry feels MindGenius was an integral part of the success of the project as it enabled many small details to be kept visible and not “lost” until they started causing problems. It gave them a clear view of every aspect of the project and allowed them to deliver on time and with no disruption to standard business processes. To manage the second phase, a Work Breakdown Structure (WBS) was developed to identify all tasks that needed to be completed. 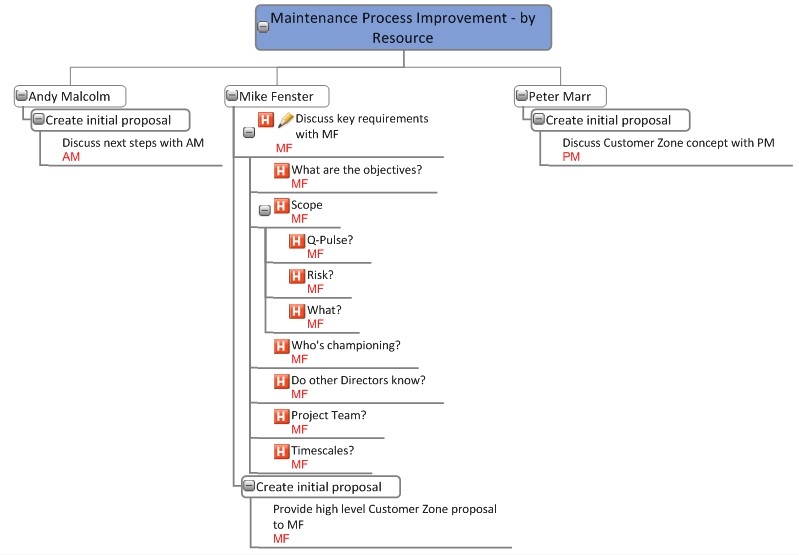 Henry then used the Gantt chart view to visualize and manage the time line, working back from the required go-live date to work out timings and milestones. To monitor task progress, comments were added to the WBS tasks and the % completion record was used in conjunction with filters to allow Henry to view outstanding tasks. 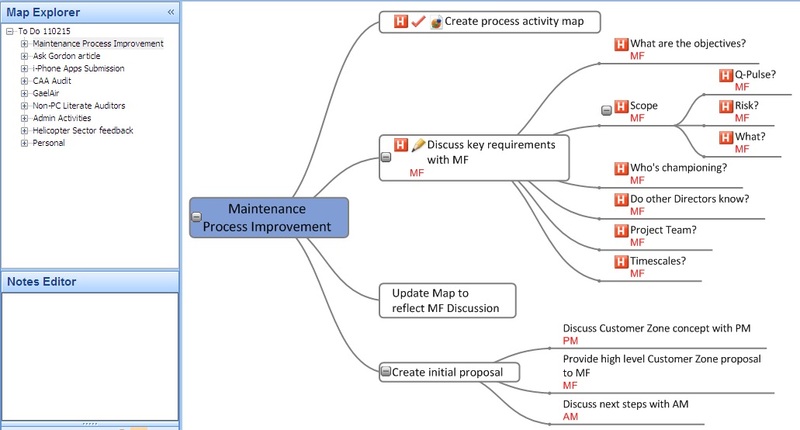 The MindGenius map was updated daily and reviewed weekly by the implementation team to manage and control the project. In the past Henry would have worked with Excel spreadsheets with action tracking lists, a method which he found more labor intensive. 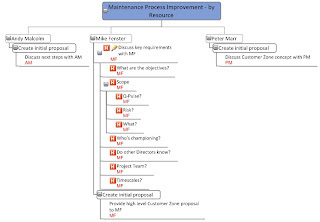 Do you use MindGenius for creating Work Breakdown Structures? Do you have any tips you would like to pass onto other users?